“It’s not always what you say, it’s how you say it.” As someone who speaks with my entire body, I’ve probably been told that line a thousand times. Positive words can come out of my mouth, but my tone and body language give me away every time. As you write grant proposals, your intention is to write positively about your organization and the solutions of your program, and yet there can end up being a tone, a negative vibe or attitude that creeps into the text, and it hangs like a pessimistic and gloomy cloud over the reviewer. 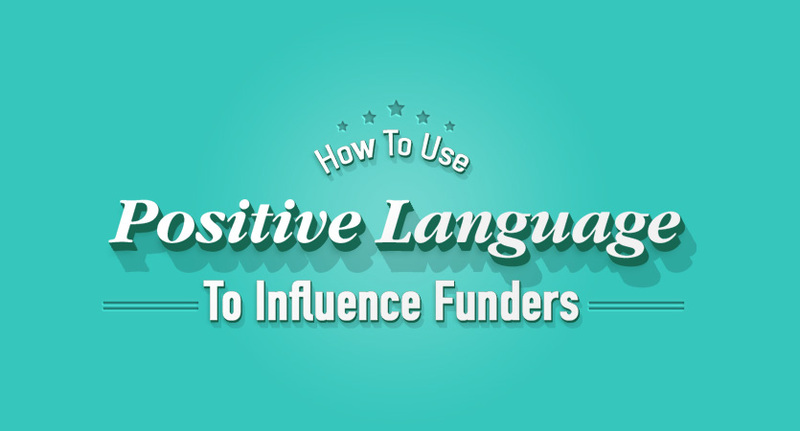 I want funders to say “yes” to you, and having a positive tone in your writing can be a powerful tool to persuading and influencing their decision. There’s something incredibly energizing about rubbing shoulders with positive people. They make you feel better about life. They seek joy, are thankful, and help you see life through a different lens. The way we write can have a similar impact. When we write in a positive way with an affirmative tone, people have an easier time getting excited and feeling good about what they’ve read. Write in a negative way, and it can obscure or overshadow the main point of what is being communicated. Positive: We value our employees. Negative: We don’t ignore our employees. I’m not sure anyone intentionally plans to communicate in a negative tone, but for some, it’s a default setting, and one that can impact the success of your grant proposals. By including certain words and abandoning others in your grant writing, you can strengthen your proposals and significantly alter the way your message comes across to the reader. There are some very specific things you can do to write grant proposals in a more positive way. Here are three tips to strengthen your proposals and demonstrate a positive tone. Although funders may want to understand some of the challenges or hurdles your organization may face to bring about the solutions you propose in your application, the focus should not be about what your organization can’t do. Don’t take time to highlight limitations or restrictions, as the negativity can sway a decision maker in the wrong direction. Instead, the focus of an excellent proposal needs to be centred on what your organization can and will accomplish. Write about the impact you will have, the possibilities and opportunities you will explore and implement, and the constructive way you will overcome impediments and barriers. It’s amazing what changing one word can do to shift the reader’s perspective. The difference between using the word “will” and the word “would” in a grant application is the difference between a reviewer believing you have the confidence to implement the program and them thinking you are tentative and limited in your approach and capacity. WOULD: The Vancouver Skill Centre would provide construction training to 40 youth in our community with funding from your organization. WILL: The Vancouver Skill Centre will provide construction training to 40 youth in our community with funding from your organization. The difference is one word, but that one word establishes the impression that the Vancouver Skill Centre is ready to do the job. Using “will” throughout the proposal influences the reviewer to feel and believe the organization is competent, confident, and fearless. It lends credibility to your proposal. The “would” statement leaves a feeling of doubt and uncertainty… two qualities you don’t want your reviewer to equate with your organization or your proposal. The review and revision process is an extremely important one in the full development of successful grant proposals. Included in the review process should be an intentional inspection for words and phrases that reflect more negatively in the application. Read each section and look for examples of negativity and plan to re-word, re-write, and re-frame them to paint a different picture. Look at the examples here for inspiration for how you might approach the revision process. Negative: The loss of leadership has made it impossible to move the program forward, but funding would allow us to deal with the problem. Positive: Funding will benefit the program and bring value through the establishment of new leadership. Negative: The damage has been done and we can’t continue to ignore the mistakes that have been made. Positive: We have learned from previous work, and progress and success will be by-products of the investment that will be made into the community. If negative phrases, like the ones written in the examples above, accumulate throughout a proposal, it can leave a reviewer feeling less than excited about your proposal. A thorough review process is an important step to take to help strengthen your applications and move them from gloomy to refreshing and exciting. In our blog post, “5 Grant Writing Tips To Make A Funder Giggle… In A Good Way,” we provided five tangible steps you could put into action to alter the fate of your proposal. Read it here.